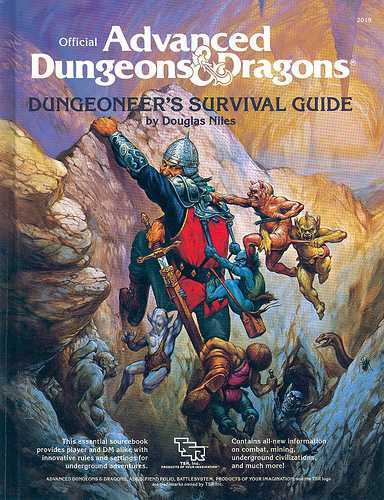 Dungeons & Dragons players have seen five editions plus a few versions that fall outside the count. We tend to see the release of a new Player’s Handbook as a clean break from the last, but each new edition received a preview in a book or two that appeared for the prior edition. 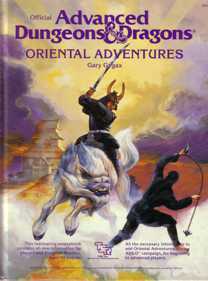 Oriental Adventures brought a taste of skills to D&D in non-weapon proficiencies. Characters gained skills such as calligraphy, etiquette, animal handling, and bowyer. Ability checks reached AD&D in the Dungeoneer’s Survival Guide (1986). Although this book’s title suggests a focus on player strategy, this guide previewed rules innovations that appeared in 2nd edition. The non-weapon proficiencies from Oriental Adventures became options in the primary game. When players used non-weapon proficiencies, they made proficiency checks to determine the outcome. These checks operated like ability checks, but proficiency improved the chance of success. For more, see Ability Checks—From the Worst Mechanic in Role-Playing Game History to a Foundation Of D&D. 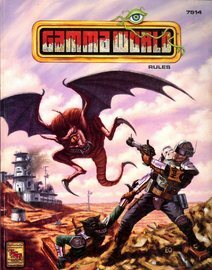 This 4th edition of Gamma World set half of the blueprint for 3rd edition D&D. The other half came from Player’s Option: Combat and Tactics (1995). Player’s Option: Combat & Tactics introduced the gridded battle map to D&D. In the Foreword, Skip Williams promises that, “You will find plenty of ways to make combat more than a dice-rolling contest or an exercise in subtracting hit points from your character’s total.” Combat & Tactics reads like an early draft of the 3rd edition combat rules, complete with rules for opportunity attacks, reach, cover, and critical hits. Combat & Tactics probably scared more players away from battle maps than it converted. The supplement moved deep into wargame territory, with over 250 pages of rules for facing, fatigue, and things like direct and indirect bombardment. However, the 3rd-edition designers chose the best of the innovations. In 2005, work on 4th-edition D&D started as a project codenamed Orcus. 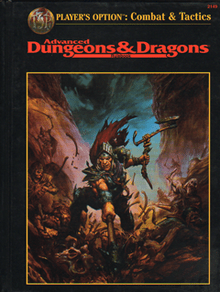 In Wizards Presents Races and Classes, lead designer Rob Heinsoo wrote, “Our instructions were to push the mechanics down interesting avenues, not to stick too close to the safe home base of D&D v.3.5.” The project team developed eight classes built around powers and giving every character some interesting action to choose each round. Tome of Battle: Book of the Nine Swords presented new martial classes for 3rd-edition D&D. The additions blended the unreal, cinematic stunts of Far-East action games and movies with a typical D&D game. Warriors gained maneuvers that worked like encounter powers in 4th edition. 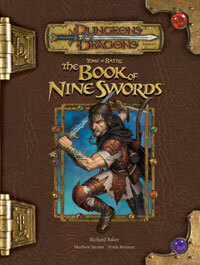 Now, used copies of the Book of Nine Swords command high prices, a scarcity which might stem from meager sales in 2006. Nonetheless, the book offered a prototype for 4th edition. Aside from a barely-noticed sample in the Book of Nine Swords, 4th edition came from a secret project. Rather than ask D&D fans what they wanted in D&D, the design team made assumptions and built a game based on them. When Mearls gained time to create a 5th edition, he stuck with the same strategy of listening to the game’s fans. In another interview, he explained that he launched the open playtest “to get a sense of what people actually wanted out of D&D. The only real mandate was to make sure that we captured the essence of D&D. It was important that anyone who had played D&D in the past could play the new edition and have a clear sense that this was D&D. Dungeons & Dragons 5th edition hardly resembles 4th edition, but Essentials showed the way to the current game’s success. This entry was posted in Role-playing game history and tagged D&D Essentials, David Zeb Cook, Dungeoneer's Survival Guide, Gamma World, Mike Donais, Mike Mearls, Oriental Adventures, Player's Option: Combat & Tactics, Rich Baker, Rob Heinsoo, Skip Williams, Steve Winter, Tome of Battle: Book of the Nine Swords. Bookmark the permalink. Fascinating! There was a lot of history here with which I was not familiar. Two pieces you didn’t mention were Alternity and Star Wars SAGA. Both seemed to be testing grounds for a new edition. The skills of Alternity, and particularly the idea of advancing your skill proficiency, were an initial version that later came into 3E. SAGA had a host of advancements that were later seen in 4E. I recall seeing the first previews of 4E and being stunned at how much was familiar due to my playing SAGA. Way back around the time both games were released, I read an interview in which Rodney Thompson stated that the SAGA design team sat in on 4e development meetings and the two games, while separate, informed each other. It’s far too long ago now for me to have a hope of finding a link, unfortunately. To this day SAGA is still one of my favourite d20 implementations, and I much prefer it to the latest Star Wars game from FFG. I’ve always thought it was a shame 4e wasn’t *more* like it, really. I definitely agree with the SW SAGA system comment. But in addition to Alternity, Dragon Fist, an all but unremembered PDF game WotC put out in 98′ would be a great fit as well. It boasts the first real reversed AC system, and BAB style later used in 3e. I miss proficiencies from 2nd ed. 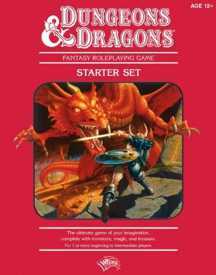 Neither d&d nor pathfinder have anything like it, but watered down generic skills that hardly represent anything like a real background. A runner can automatically swim? This sort of cross over makes no sense. I understand streamlining but in every case where it’s done, it feels like something is lost. Should be a middle ground.